Oh, he's gonna make you sweat…he's known to take the audience to hot spots as he croons with his jack swing style. Keith Sweat is the master, the perfecter of the new jack swing genre, taking it to unparalleled heights. To hear silky, smooth, soulful jack swing music is truly a luxury these days. Yet Keith Sweat is serving it on a sizzling platter right at your doorstep, so to speak. 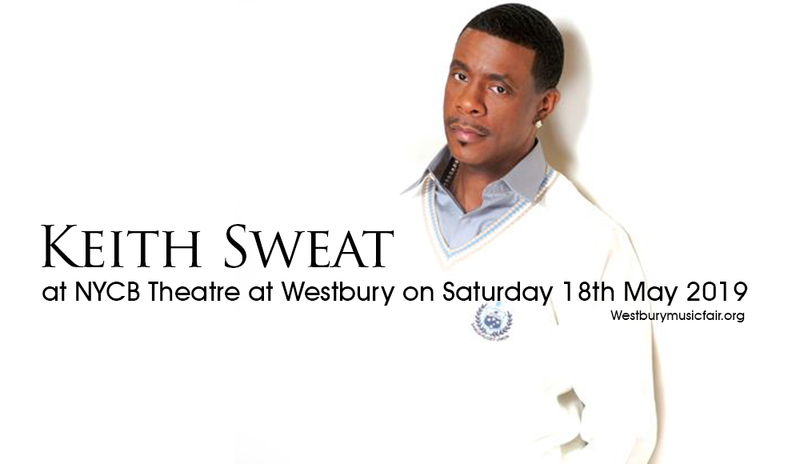 No need to go and search far and wide, Keith Sweat is swinging by this side of town on Saturday 18th May 2019, at the NYCB Theatre at Westbury on Saturday 18th May 2019. The great thing about this, booking tickets to the show is no sweat! Just click 'buy tickets', then you're well on your way to the most enthralling jack swing show ever! Music historians credit Keith Sweat as the pioneer of the New Jack Swing genre — a fusion of RnB, soul, high-tech electronic funk, hip hop, and occasional elements of rap. It was his 1987 debut album "Make It Last Forever" with its biggest chart-topping single "I Want Her" that ushered in this magical silky and smooth fusion that catapulted him to become a global phenomenon and gave Sweat a nomination for a 1989 Soul Train Song Of The Year Award. Keith was on a winning streak as he released his second album "I'll Give All My Love to You" coming in at #6. His third release in 1991 "Keep It Comin'", featured R&B legend LL Cool J on one of the hit singles. In 1997, he was bestowed with the title of Favorite Male R&B/Soul Artist following the release of his fifth and self-titled album. In 2013, he was honored with the Soultrain Lifetime Achievement Award, recognizing the breadth of his achievement and contribution to soul and RnB music. Lock-in this date, pin this venue and tag your friends. Come one, come all and enjoy the music and showmanship of Keith Sweat!